We accept all PPO insurances at Advanced Dental Care! If you are using dental insurance at your dental visits, you will receive an Explanation of Benefits or EOB either by mail or email shortly after your visit. EOBs can be confusing, because they look a lot like invoices (and nobody likes invoices!). An EOB is provided to patients covered by insurance to explain what services were rendered by a provider and what the insurance company paid for on behalf of the patient. Learning how to read EOBs is very useful to making sure you are aware of what your insurance company covers for you and instances where they did not pay for a service. A standard dental EOB will have the subscriber’s name, the patient’s name, your member ID, and the claim number. It is important to make sure that your information is correct so there are no mix-ups with another patient. The EOB will show the date(s) of service, the ADA code, and a short description of the services performed. Most descriptions of services are in technical dental language, so if you are not sure what the service is, please call us and ask! Next to the service, you will generally see what the standard fee or “Billed Amount” is for the service you received and then under “Allowable Amount”, you will see the fee your provider has agreed to accept from your insurance company. Doctors take a steep discount to be in-network with your insurance company, often times receiving less than half of what the service costs to perform. Next to the “Allowable Amount” field, you will see what the insurance company paid and the remaining amount that the patient is responsible for paying. 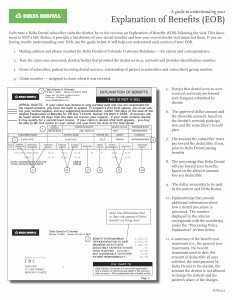 Keep in mind, the EOB is NOT an invoice. Many times you have already paid your portion as a co-pay at your visit. Sometimes the amounts may not seem right. For example, if your insurance company pays 80% for composite (white) fillings, yet they only paid 60%, this could be a result of a deductible that applied or because your insurance company chose not to pay for the service rendered. There is generally a legend on the EOB with remarks or service code notes which will further explain the reason for not paying for the services rendered. When an insurance company chooses not to pay for a service rendered, they either don’t pay at all or they downgrade to a different service. We see this a lot with dental work performed on posterior (back) teeth. A lot of insurance companies have decided that if a tooth in the back requires dental treatment, they will not cover treatments that are aesthetic. This means they won’t pay for a white composite filling, but they will cover a silver mercury amalgam filling. At Advanced Dental Care, we’re not going to cut corners or put undesirable mercury fillings in your mouth just because your insurance company won’t pay. At Advanced Dental Care, we will fully perform an insurance eligibility check prior to your appointment to verify what benefits your insurance will assist you with. During your appointment, we are here to answer any questions you may have about your particular insurance plan. If you do need any dental treatments, we will prepare a treatment plan and go over your plan in detail prior to ever starting any treatment. When it comes to dental care, we know you don’t like surprises and neither do we! 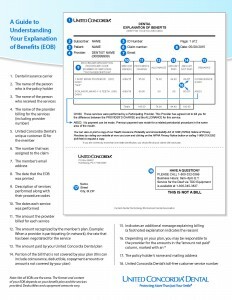 We do our best to ensure the Explanation of Benefits (EOB) you receive in the mail is pretty darn close to what we estimated in our office. For large treatments, we can also preauthorize services with your insurance company. It is also important to know that we would never just send you an invoice in the mail without contacting you first. Our patients deserve a full explanation of why their insurance did not assist them with their services and a chance to petition the insurance company to pay first. If for any reason either we cannot get the insurance company to pay, there are always other solutions! For more information or to schedule an appointment, please call (714) 793-0686 or visit us at www.mycostamesadentist.com! Our friendly and knowledgeable staff members are standing by 24 hours a day, 7 days a week for any questions or dental emergencies! Click here to see a map of our location!